Stop #2 on my father and I’s little culinary adventure in Gulf Gate led us to Jim’s Small Batch Bakery and WOW this was the highlight of the day for me. This tiny little shop tucked away in the corner of Gulf Gate is just awesome, with a staff who clearly has a ton of integrity about what they do. Jim was on hand to chat and give us some samples of his sorbets and ice creams and I simply couldn’t resist. 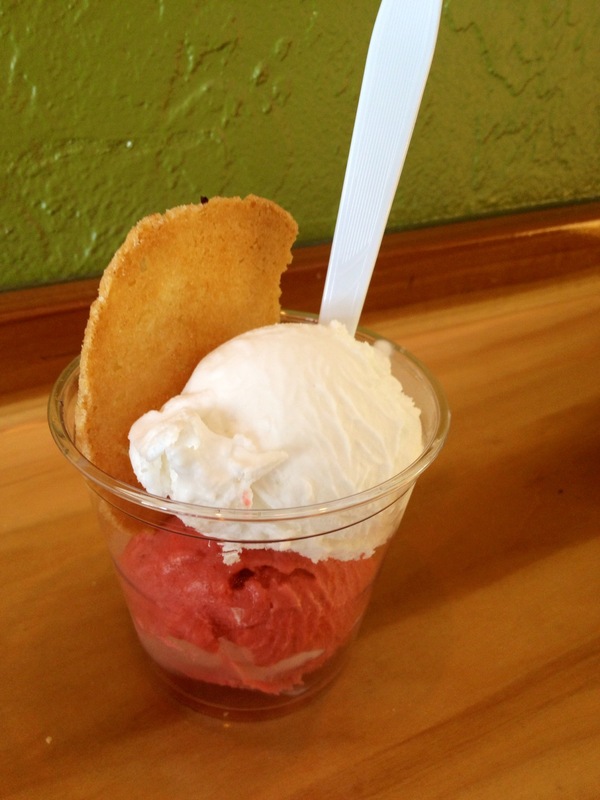 I ended up with a scoop of coconut sorbet and a scoop of strawberry sorbet and they were both so incredibly delicious. Smooth, creamy and very natural with nothing but the fruit, a little sugar and a binding ingredient. Some of the best sorbet I’ve ever had actually. I couldn’t help topping my cup with a lemon sand dollar cookie that was super thin, crisp and delicate. I also tasted my father’s vanilla ice cream which was equally outstanding. The case full of treats was extremely tempting, and I’m lucky that I work pretty close by. I will absolutely be back for lunch soon- as they had a wonderful little menu of sandwiches, soups and quiches in addition to their baked goods. The almond croissant was LOUDLY calling my name and I promised it that I’d come back for it soon. The lemon bar, breads and cakes also looked amazing and I’m sure I’ll eventually try them all. YUM. I will be back within a week, I’m sure of it. Thanks Jim!